Munich - Let's be honest - everyone loves to see goals, and any player who can unlock defences with a perfectly-weighted pass or delicate chip will instantly become a fan favourite. 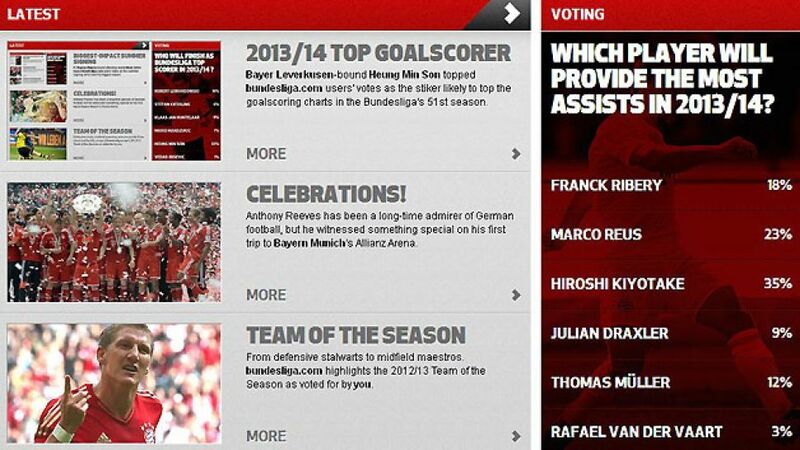 Hiroshi Kiyotake is a case in point, with more than a third of bundesliga.com's users backing him to blaze the assist-giving trail in the 2013/14 campaign. Having provided the killer pass for ten of 1. FC Nuremberg's 39 league goals last term, the versatile Japanese international was crucial in the Franconians' trouble-free 2012/13 existence, a fact made all the more impressive considering it was the midfielder's maiden year in Germany's top flight. Whether from a set-piece or on the wing, or dumbfounding defenders with a blur of fleet-footed wizardry, Kiyotake was a constant menace, chipping in with four goals of his own. And that in a team that finished tenth. With only FC Bayern players above him in the 2012/13 assist chart, it is small wonder 35 per cent of the votes went the 23-year-old's way. Second place (23 per cent) went to a fellow debutant, with Marco Reus enjoying a fabulous first season at UEFA Champions League finalists Borussia Dortmund. Nine assists and 14 goals were ascribed to the nimble attacker, and in the wake of Mario Götze's departure to FC Bayern Munich, Reus may now be given even greater creative freedom in a more central role. FC Bayern coach Pep Guardiola could opt for a similar option with vote bronze-medalist Franck Ribery (18 per cent), having already fielded him behind the striker in recent friendly matches. However, seeing as the Frenchman's 14 assists in 2012/13 were unmatched in the Bundesliga, the Catalan strategist will be a brave man to change a winning formula. Ribery's Bayern colleague Thomas Müller came joint-second in last season's charts (alongside team-mate Philipp Lahm), creating 11 goals and thus tempting 12 per cent of voters to trust the lanky Germany international to play a similar role in 2013/14. In recognition of Julian Draxler's unstoppable ascent, nine per cent tipped the 19-year-old FC Schalke midfielder to claim top spot, while Hamburger SV's experienced playmaker Rafael van der Vaart has only been given an outside chance, with three per cent of bundesliga.com's users believing the Dutchman will set up the most goals. Don't forget to have your say in our new vote: Which new signing will score the most goals?